Ready to feel old? The mobile phone turned 40 yesterday. Let's take a little trip through time. On April 3rd, 1973, Motorola engineer Marty Cooper made the first call from a mobile in downtown Manhattan. 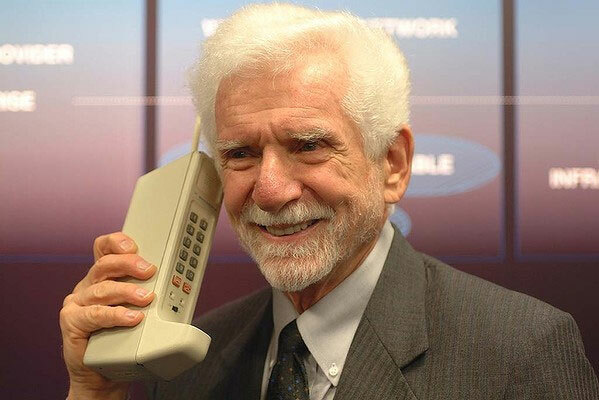 Mobile phone inventor Marty Cooper holding an early phone to his ear. Next time you want to throw your iPhone or Android through a window, pause, look at this picture, and remember how far we've come. That thing is huge and weighed almost a kilo! Think smartphones are expensive? When mobiles first hit the market about ten years after Marty's call, they were priced at $3,900. And remember, this is 1983 money -- that's a hefty chunk of change! As I'm sure you've noticed, phones have become smaller, sleeker, and way more powerful. But with great power comes great responsibility (thanks Spiderman!). And Marty's phone had one big benefit over today's smartphones. You couldn't hack that brick. Nobody was stealing Marty's location data, credit card info, name, or anything else through that grey behemoth. But mobile malware and fraud is a huge issue with today's technology and it's only going to get worse. So before you go crazy celebrating 40 years of mobile freedom and downloading every app that crosses your screen, take a moment to think about your security. Make sure your mobile OS is up to date, make sure your apps are updated, check to make sure you know which apps can access your personal information and who they deliver it to, and most of all -- use your common sense to make sure YOU are in control of your data. Can you imagine a world without mobile phone? How it would change?